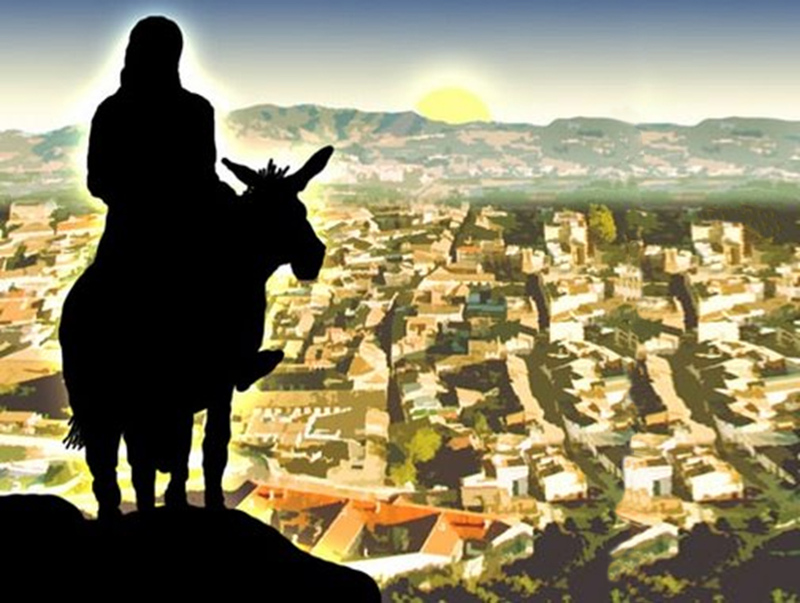 As they approached Jerusalem and came to Bethphage on the Mount of Olives, Jesus sent two disciples, saying to them, "Go to the village ahead of you, and at once you will find a donkey tied there, with her colt by her. Untie them and bring them to me. If anyone says anything to you, tell him that the Lord needs them, and he will send them right away." This took place to fulfill what was spoken through the prophet: "Say to the Daughter of Zion, `See, your king comes to you, gentle and riding on a donkey, on a colt, the foal of a donkey.'" The disciples went and did as Jesus had instructed them. They brought the donkey and the colt, placed their cloaks on them, and Jesus sat on them. A very large crowd spread their cloaks on the road, while others cut branches from the trees and spread them on the road. The crowds that went ahead of him and those that followed shouted, "Hosanna to the Son of David!" "Blessed is he who comes in the name of the Lord!" "Hosanna in the highest!" When Jesus entered Jerusalem, the whole city was stirred and asked, "Who is this?" The crowds answered, "This is Jesus, the prophet from Nazareth in Galilee." You may have noticed that today our worship service has a double theme. We heard early in the service how the city welcomed Jesus on the Sunday and then later we heard how they killed him on the Friday. That’s the story of Holy Week – the triumphal procession of palm branches and shouts of Hosanna followed by the procession with the cross to Calvary accompanied with the shouts of "Crucify him!" What is it that turned a day of praise and shouts of joy, a day when palm branches were waved to welcome a king, to a day of hatred, scorn, ridicule and shouts calling for the death of a man who had done nothing but good? What had Jesus done that the people of Jerusalem should change their opinion of him? One day they love and respect him, and a few days later, they show nothing but scorn and contempt. During that last week, Jesus had a meal with Simon who had once been a leper, he showed love to the woman who anointed him with expensive perfume. He probably ruffled a few feathers when he drove out the moneychangers and merchants from the Temple but he immediately went to work healing the blind and the crippled. Children sang about Jesus praising him for his love and kindness. So, what went wrong? Why, in such a short space of time, did people start to call out for the blood of Jesus, wanting him crucified? Remember crucifixion was the worst kind of thing anyone could wish on someone else. It was a cruel, torturous, painful, slow, very slow, way of dying. Why did people suddenly want Jesus to suffer the kind of punishment reserved for their worst enemies? Jesus attracted crowds wherever he went. They came from near and far to see him, to witness the amazing things he was doing, to hear his words about love for God and other people. But in any crowd – then and now – you get two kinds of people – the believers and the doubters. Jesus not only inspired wonder but also anger. For example: When Jesus healed the man born blind by making mud with dirt and spit and anointing his eyes with it, some believed it to be a great miracle and believed that indeed Jesus was the Messiah. There were also those who did not believe. They kept questioning the healed man, and his parents, and his neighbours. And then they accused both the man and Jesus of being agents of the Devil. Some for – some against. The cheerers - and the jeerers. There are those who have studied crowd behaviour and their research has proven very beneficial to those who organise big sporting events, rock concerts and so on. Some interesting experiments have been conducted by psychologists to understand why crowds of people behave the way they do. And these experiments show how readily people will change their opinion to match the crowd. The experiment was simple. A group of people were seated in a dimly lit room. On to a screen at the front of the room, two straight lines were projected. One was obviously longer than the other. The task was simple. State which line was longer. However, unknown to one person in the room, it was set up. All of the other people in the room had been told to lie. So – this one person had twenty or so other people around him saying that line A was the longer one. Everyone agreed. In actual fact, it was clear that line B was longer. What happened? Well, the experiment showed that the one whose opinion was different changed his opinion to that of the rest of the crowd. And - even after the experiment was finished, and he was told what was going on, he still held to his changed opinion – that line "A" was longer. That's how persuasive the effect of a crowd is. It will even sway you to an obviously wrong opinion - and keep you there. We see this all the time in fashion. An individual or a small group start a trend until everyone thinks they are old fashioned if they don’t follow the trend. If you don’t believe me here are few examples - lambchop sideburns, hot pants, mini skirts, silk shirts with huge collars, safari suits, brightly coloured bell-bottom pants. We wore those things because it was popular to dress and look like that in the 70s. Someone started a trend and the crowd followed. Twenty years from now people are going to look back on body piercing and tattooing and say, "Where was my brain when I had that done?" And we find in the Gospel account how a crowd was influenced by a small group of people who were opposed to Jesus. This small group of religious leaders felt threatened by Jesus’ popularity. Their religious sensitivity had been upset by the claims of Jesus that he was the Messiah, the Son of God and his disregard for church’s laws by healing on the Sabbath. They could not see how a simple carpenter from Nazareth could be who he claimed to be. They were especially angered when they saw the crowd of people cheering Jesus as he rode into Jerusalem; their "hosannas", calling him David’s son, and hailing him as a king was all too much. And so, we hear how this small group changed the crowd’s opinion of Jesus. Matthew records, "The chief priests and the elders persuaded the crowd to ask Pilate to set Barabbas free and have Jesus put to death" (Matthew 27:20). What may have started with a few voices calling out to Pilate to crucify Jesus, ended with the whole crowd calling out for the death of Jesus. Mark records, "The chief priests stirred up the crowd to ask that Pilate set Barabbas free for them. Pilate spoke again to the crowd, "What, then, do you want me to do with the one you call the king of the Jews?" They shouted back, "Crucify him!" "But what crime has he committed?" Pilate asked. They shouted all the louder, "Crucify him!" (Mark 15:11-14). Even the Roman Governor was pressured by the crowd to believe that Jesus was guilty. And so Pilate released Barabbas for them; and after flogging Jesus, he handed him over to be crucified. The crowds turned out on Sunday to shout "Hosanna", and they turned out on Friday to shout, "Let him be crucified!" And here today with the church decorated once more with palm leaves, we are happy to join with the crowd of long ago and sing heartily "Hosanna". We have cheered with the crowd that cheered for Jesus - and rightly so - for Jesus deserves all our cheers. We join the cheering crowd because Jesus loved sinners, lepers, and tax collectors. We cheer with the crowd because he helped people in their time of sickness, grief, and death. We join the cheering crowd because of his love that reaches out no matter who we are or what we have done. We cheer because God has saved us. But we also cheer with a heavy heart because we know what is to come. We know that Jesus suffered and died because of the insistence of the crowd that Jesus should die. Jesus died on the cross because of the crowd and for the crowd. We are part of that crowd. The African-American song asks the question, "Were you there when they crucified my Lord? Were you there when they nailed him to a tree?" The answer is yes, a definite yes. "We were in the crowd that day when our life began again" to use a line from the hymn "When his time was over" (Robin Mann, Together in Song No 357). We may not have been there physically but it was our sin that nailed him to the cross. It was because of our sin that he endured so much suffering. Not only was he rejected by the crowd that day, but he was also abandoned by the heavenly Father. It was bad enough being rejected by his fellow Jews, the people whom God had taken special care of over the centuries, but to be rejected by the Father. We can’t begin to imagine how Jesus must have felt when he called out, "My God, My God why have you forsaken me?" Rejected by both God and man, alone, he dies for us. Alone he takes our place and dies for you and me. Alone he endures the punishment that should have been ours. With the weight of the sin of all humanity bearing down on him, he calls out, "It is finished". God's work of salvation is complete. We have a crowd mentality here in Australia also. The crowd says that Jesus isn’t important and that you can get along quite all right without him. And so, people follow the crowd and stay right away from Jesus, going to their graves without any hope. They have never bothered to find out if there really is any thing beyond this life. They have simply never bothered to find out if Jesus really does have something to offer for everyday living in this world. The mentality of the Australian crowd is "She’ll be right, mate". But will "she be all right" when it comes to the day they die and find out that they have been following the wrong crowd, the crowd that has led them nowhere. They will find that the crowd was wrong – Jesus does offer something worthwhile. He has given his life for them. A king on a donkey is laughable. A king whose kingship is proclaimed on a sarcastic placard by a Roman governor is absurd. A king who dies on a cross. A king who is the laughing stock of Jerusalem. But this is the king God has sent us. He is our Saviour. Because of what Jesus has done for us and our faith in him, one day we will be in that great crowd gathered around the throne of God, and there everyone will shout words of praise, heavenly hosannas, that will ring through all eternity, "To him who sits on the throne and to the Lamb be praise and honour and glory and power, for ever and ever!" Rev (5:13). Amen.